Iron Horse Vineyards and Winery is legend for making superb sparkling wines. Iron Horse produces exclusively estate bottled wines imbuing a distinct “sense of place”. They are specific to the Green Valley AVA, our vineyard and the vintage. We never resort to “recipe” winemaking. The wines are elegant, bright, focused, highly nuanced, soft and silky. They exude quality and class. Above all, winemaker David Munksgard strives for exquisite balance. The Sparkling Wines exceed French standards for vintage quality, belonging to the category of “Grower Champagne”. They are known for their supreme balance and nuanced texture. The wines show a commitment to quality that extends across three generations with vision, passion and dedication. To bring in 2015 we had this 2010 Blanc de Blancs and it was as expected, truly exceptional. The nose and mouth taste reflect orange zest, lime and minerality. To me it really honors the sense memory of ocean brine and that fresh, crisp and refreshing feel of the Pacific Ocean. 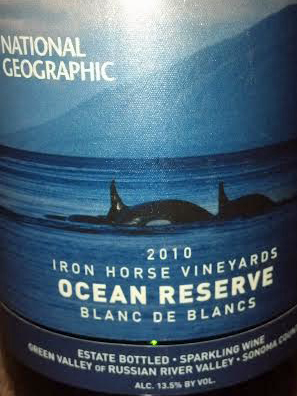 As part of the winery’s sustainability practices and respect for the environment Iron Horse gives $4 a bottle to National Geographic’s Ocean Initiative, establishing marine protected areas and supporting sustainable fishing practices around the globe. This cuvee is a blend of two Chardonnay clones – Clone 4 Hyde Old Wente from four different blocks on the estate.